You can create designs in Photoshop CS5 and then import the native PSD files from Photoshop directly into InDesign. InDesign CS5 provides you with additional control over the designs after an image is imported into a layout. Have a layered Photoshop file ready to place. Browse to the location of a layered image file, select the file you want to import, select the Show Import Options check box, and then click Open. Choose which Photoshop layers you want to use when placing a PSD file into your InDesign layout. 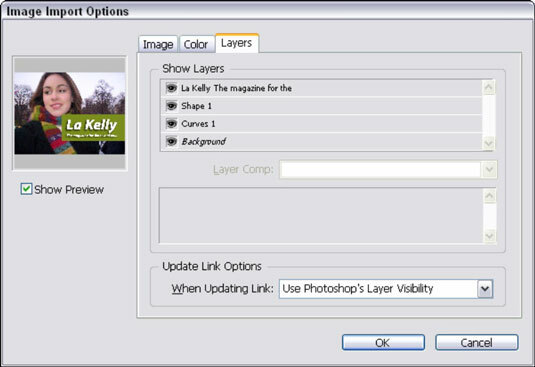 Click the Layers tab and turn off and on the visibility of the layers you want to change or select a saved layer comp from the Layer Comp drop-down list. Click OK to close the Image Import Options dialog box. Many Photoshop files use transparency. The transparency in the PSD files is imported and interpreted by InDesign. This feature is particularly useful when you have an established background or want to have interesting text wrap around an image you import from Photoshop. Basically, you can use the transparency as a clipping path in InDesign. A clipping path resembles a hard-edged mask that hides parts of an image, such as a background, that you don’t want visible around a certain part of the image. You can use alpha channels, paths, and masks that you create in Photoshop in InDesign. InDesign recognizes these parts of the PSD file, so you can use them when you’re wrapping text around the image or when you want to create a clipping path. Alternatively, you can also use these parts to remove a background from the image. For example, if you have an image with one of these assets, you can use the Detect Edges feature in InDesign to detect the edges and wrap text around the image. If you’re using spot colors in an image you import from Photoshop, those colors show up in the Swatches panel in InDesign. There is a chance that a color from your spot colors channel won’t be recognized. If that’s the case, the color is shown as gray instead. You can use the swatches imported with the Photoshop file with other parts of your file. Simply use the swatches as you would any other swatch in InDesign. You can’t delete these swatches unless you remove the Photoshop file that you imported into InDesign.